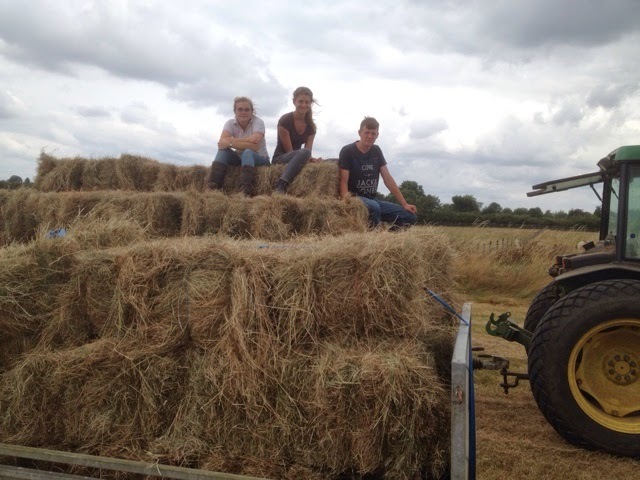 Katie, Sam, Freya and Will the Toft Alpaca Hay team. 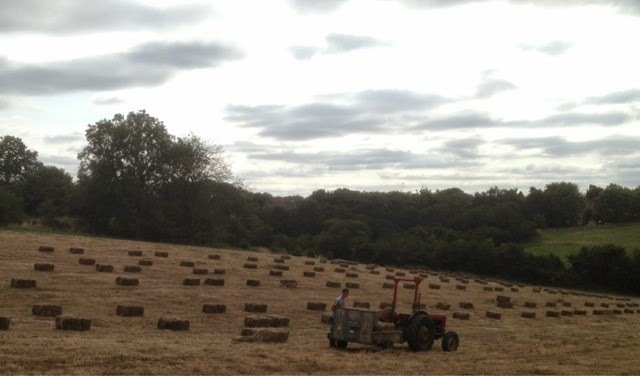 Over the past two days we've carted in maybe 1500 bales of alpaca chomp. And stacked it in the sheds. Unfortunately two hours after this photie the heavens opened and stopped work for the day. 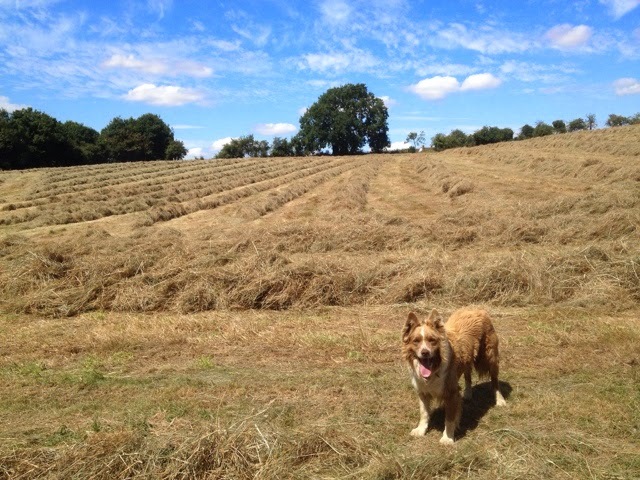 Looking at the forecast it might be late next week when we finish toting in the hay. 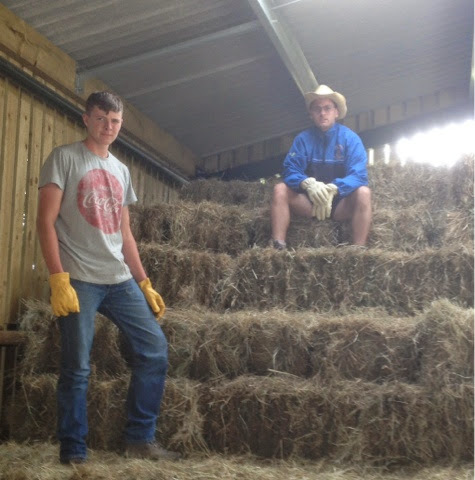 By that time there'll be another Hay team in place as Sam and Katie are only with us this week on work experience and Will has come all the way from Betswy Coed to give me a hand with the hay. 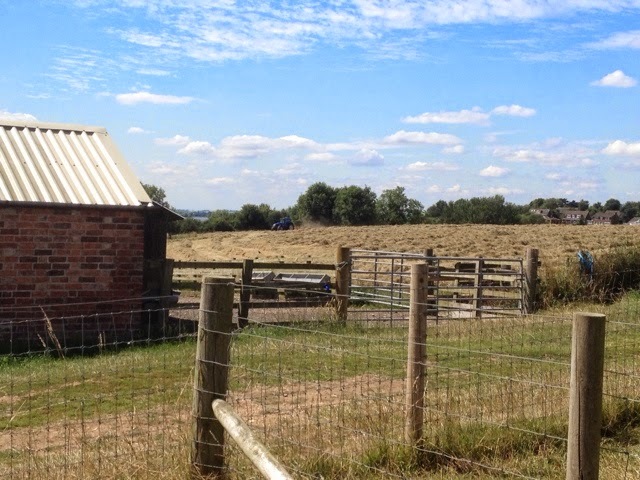 The 'country character' in the straw hat is our camera shy herdswoman Linda who is normally to be seen running around with a bale in each hand. 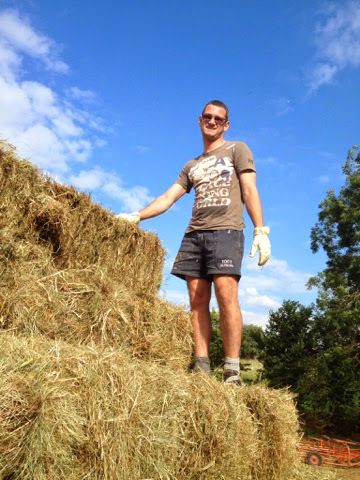 Yer man rocked up yesterday morning to row up and by 2pm we were toting bales of Hay from the field to the barn. 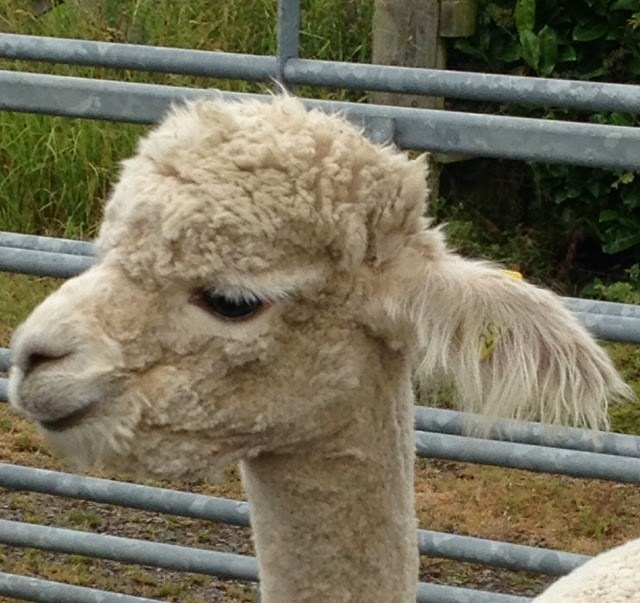 We shall probably be at this all today and most of tomorrow until we get all the alpaca chomp into the barn. It remains to be seen whether. I shall be able to lift my tea by this evening. 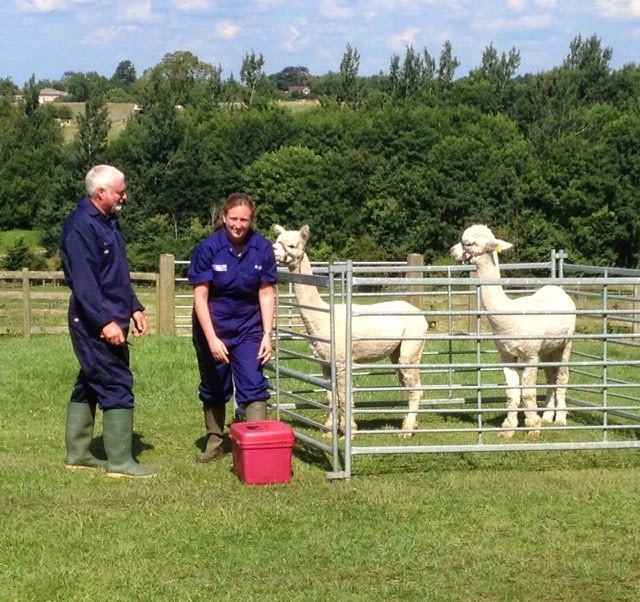 Towcester Vets organised an alpaca blood drive today to collect blood in order to spin down plasma for a number of breeders in the region. 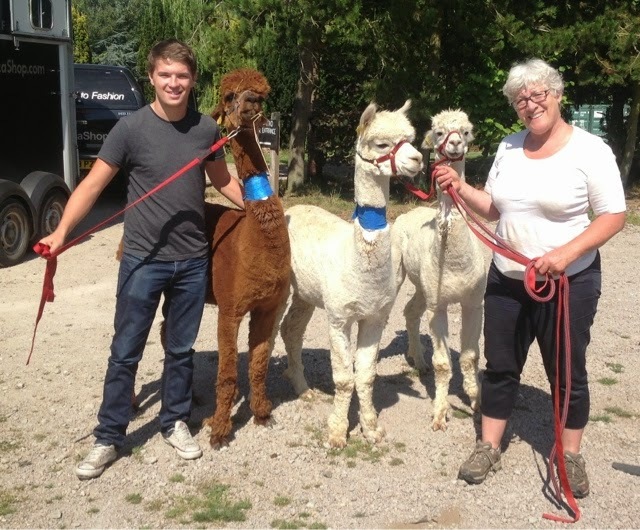 Shirley set off early doors with three pet males accompanied by Sam our vet student who is with us this week on work experience. Toft were first in the queue at the crack of Sparrows, followed by Willoughby Alpacas, Brampton Valley and Andante with no doubt many more herds to follow throughout the day. 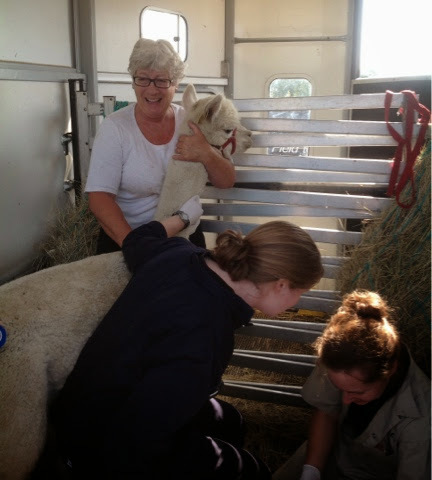 Each herd brings in a couple of alpaca donors, blood is collected in the trailers by the vets and the whole thing is organised to minimise call out times and keep costs to a minimum. Wendy from the Pet Blood Bank was stood by ready to take the blood off for processing. The individual units of plasma will be returned to the individual donor farms. 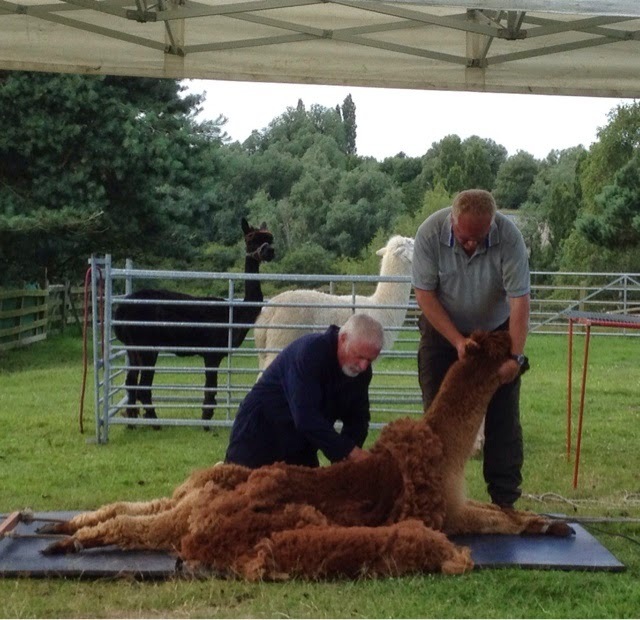 It was a group blood collection for all and very much a first for the alpaca industry and is not a service exclusive to the Midlands. 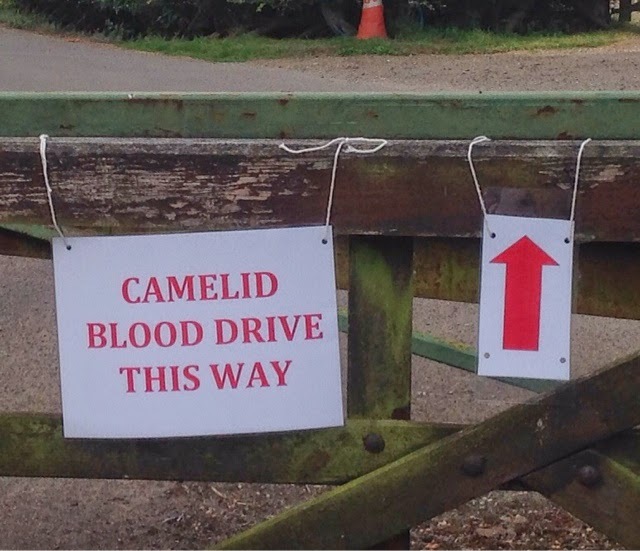 Towcester Vets will collect blood from all the participating herds and ship and process it collectively in order to keep the costs down on what is a very expensive business. 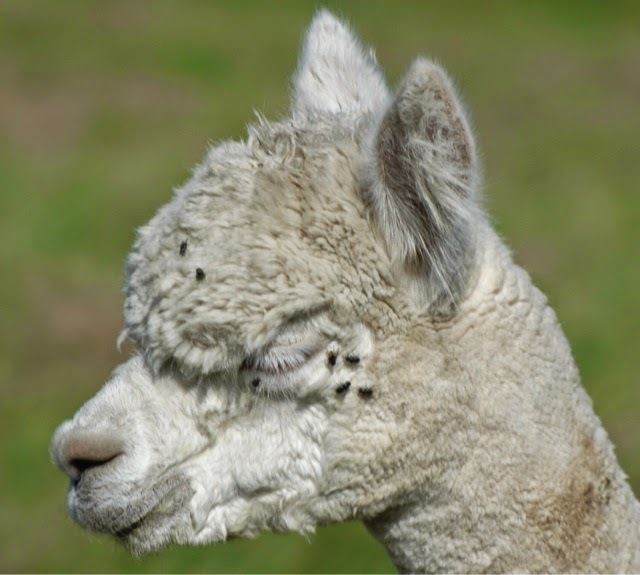 We have organised our own Plasma collection for years but it's great that the vets are now providing the service for all Alpaca Breeders. 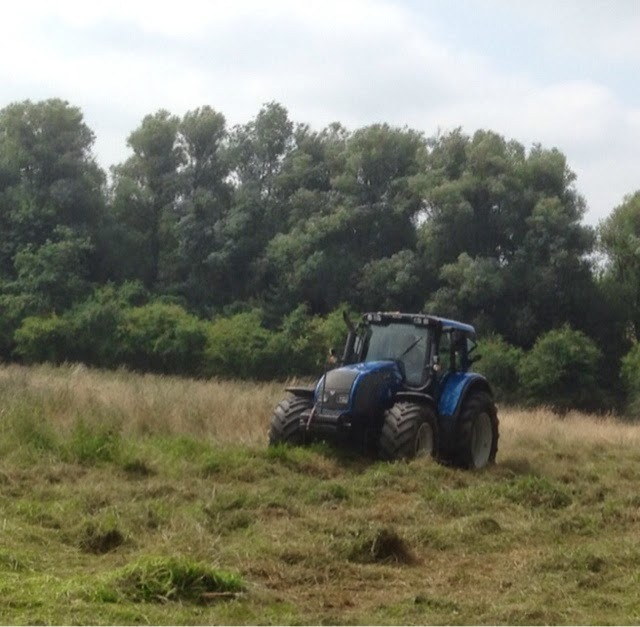 Well done Towcester Vets for this very welcome major initiative and we wish you every success. Well now it's official. Kerry Lord has been published and what a first book to get away. Edward's Menagerie is stylish, modern and very very readable and a credit to our talented daughter. Congratulations Kerry on a brilliant piece of work, thankyou for all the members of the TOFT team for another fabulous day on the Manor. 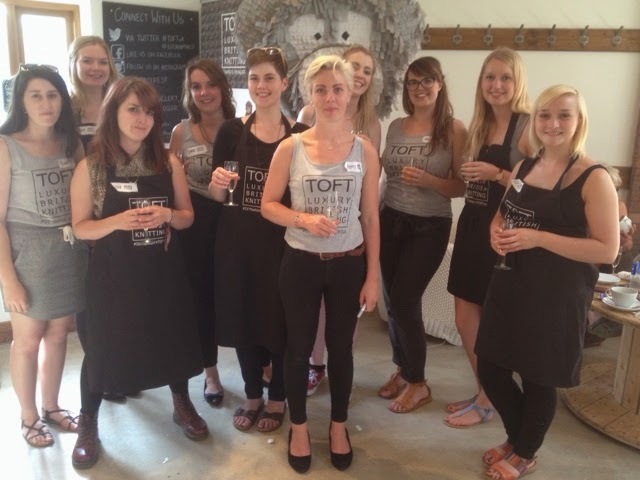 Sadly Alison, Elly and Lisa, our textile interns, will be leaving us this week. We have thoroughly enjoyed your company over recent months and are very grateful for your contribution and hope your stay with us has been worthwhile. We thankyou all and wish you all well as you go on to complete your studies. We welcome in your place, Fiona, Petra and Liz who have a hard act to follow. Thanks again ladies and congratulations Kerry. 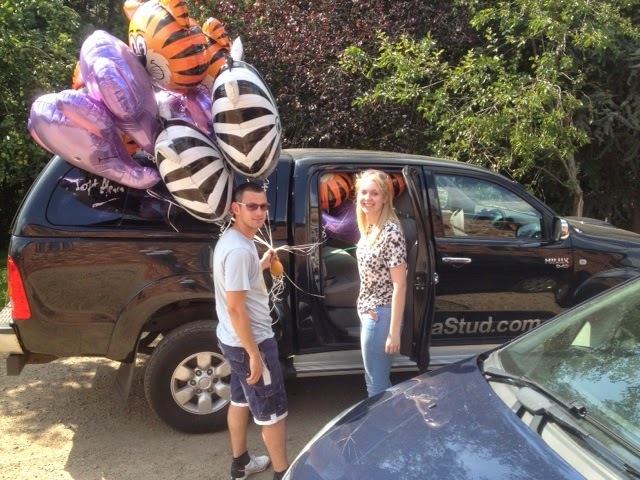 Car was packed with Blooms last night as Scott and Alison went off to collect the decorations. 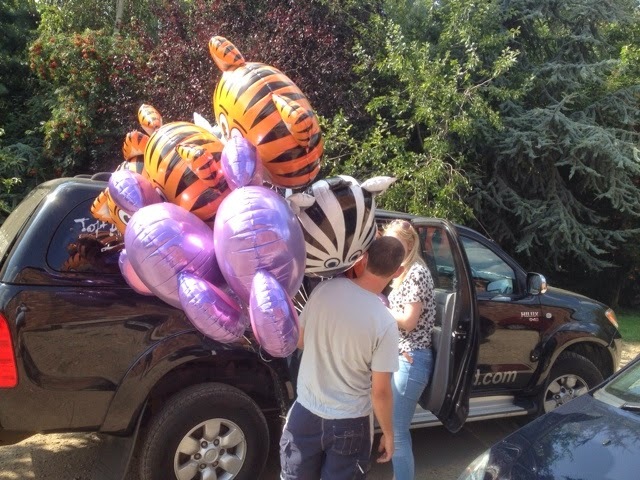 It was a lot of Bloons in a big car and obviously lots of fun getting them to the TOFT studio. Big day on the Manor today at the launch of Kerry's book - Edward's Menagerie. Reps from all the knitting and crocheting mags, webs and channels are swanning into the studio for crafty fun and games. The book is truly stunning and a real credit to the creative talents of our daughter Kerry Lord. Have a great launch babe and enjoy! 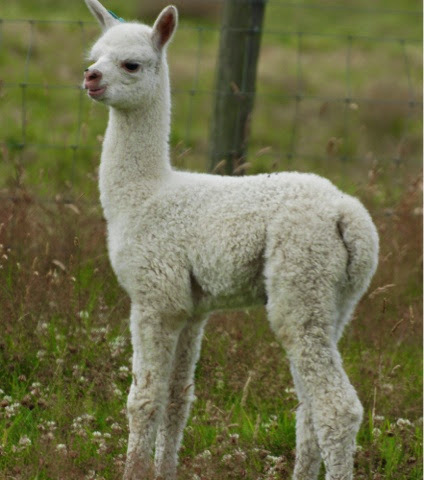 We have not bred a multi coloured alpaca in five years and last Saturday we had two in ten minutes, on my watch, from two different fathers. Two lovely fleeces on two wonderful pet boys who will sell like hot cakes and add a lot of character to someone's paddock once they are weaned. 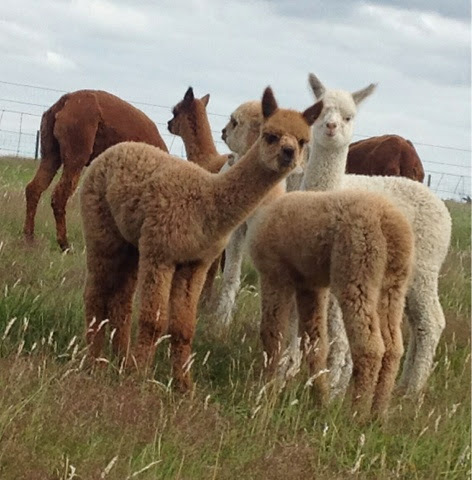 It is one of the great ironies of alpaca breeding that we spend seventeen seasons breeding one coloured alpacas and as soon as a multi adds contrast into our paddocks people fight to buy them. 'Twas ever thus! 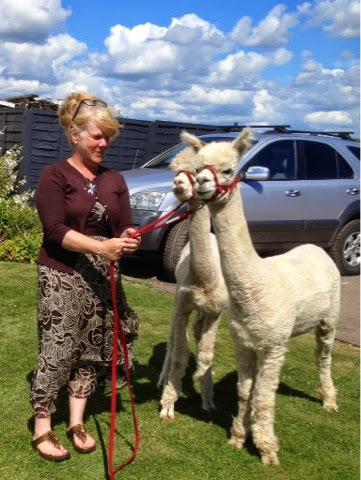 What else does an alpaca owner do if he finds a spare hour on a lovely Sunday? 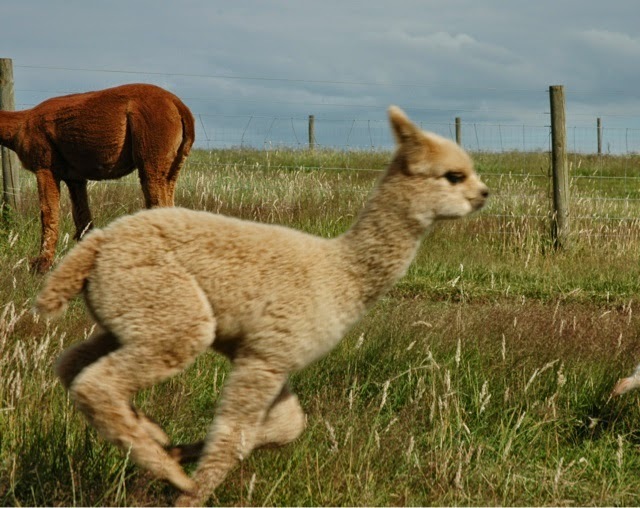 He wanders out into the fields with his camera and sees if he can capture a a little bit of the alpaca joy he experiences daily. 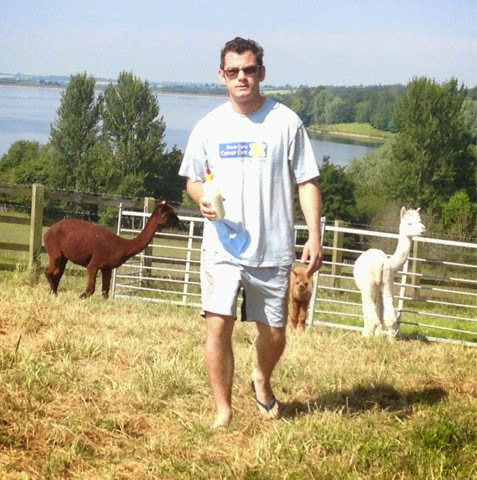 Here he is on the ten o'clock feed the Toft alpaca milkman. My eldest son Scott is back home for while since returning from working in Angola and before embarking on his next adventure, possibly in China- the boyo speaks Mandarin. 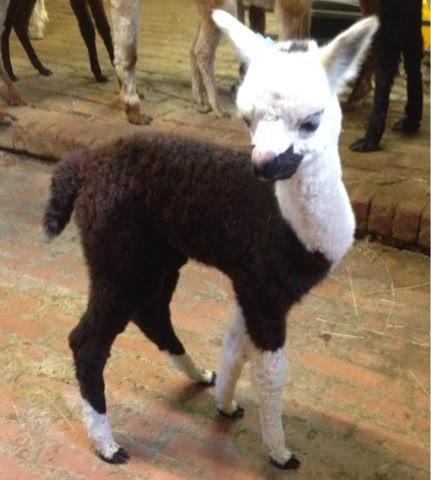 We have been bottle feeding a cria this season from birth. This is a most unusual occurrence for us. Normally we may bottle feed one or two for a few weeks until Mum takes over but young Pippa had a few problems at birth and now we are bottle feeding until the hard feed takes over. Here's the boyo on the 10am feed, second of the day and they come every three hours until the last one at 10pm. So the milkman is kept well busy. 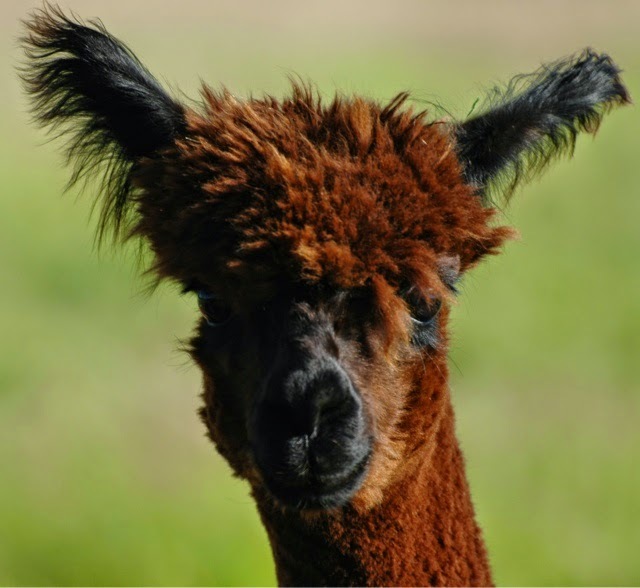 Scott is a dedicated Alpaquero and turns his hand to all things alpaca while he is here and thankfully he is ever so meticulous in his husbandry. Maybe it's time he found a good lady to distract him a little. 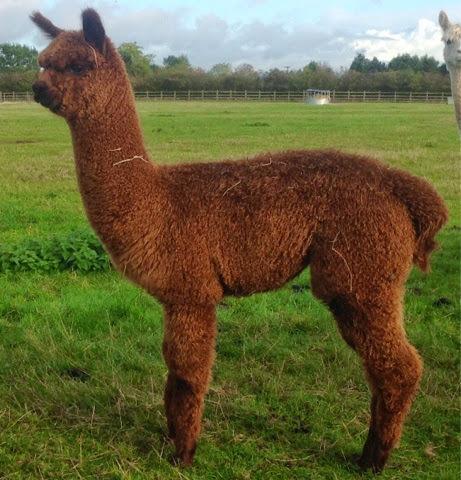 Had to whizz a client's cria off to the vets yesterday for a plasma transfusion as it's protein levels were low suggestive of failure of successful passive transfer. 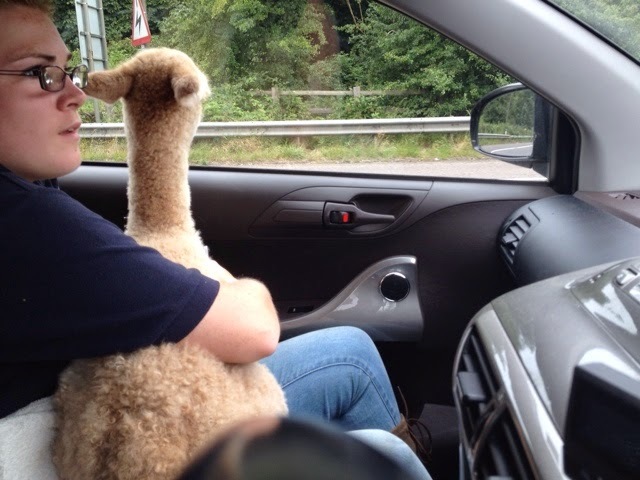 Hilux was away so it's into Shirley's IQ (half a car) with trainee herdswoman Freya holding onto the cria in the passnger seat. Unfortunately it was a Friday and we got caught in a traffic jam on the M1 not 20 mins after leaving. What should have been 30 mins turned into an hour 3/4 of an hour for the plasma infusion and then 30 mins back to get the wee girl back with her Mum ASAP. All well, no problems and the wee one was strutting around with her red 'scarf' all evening as testimony to the days events. What else would you do on a sunny Friday afternoon? 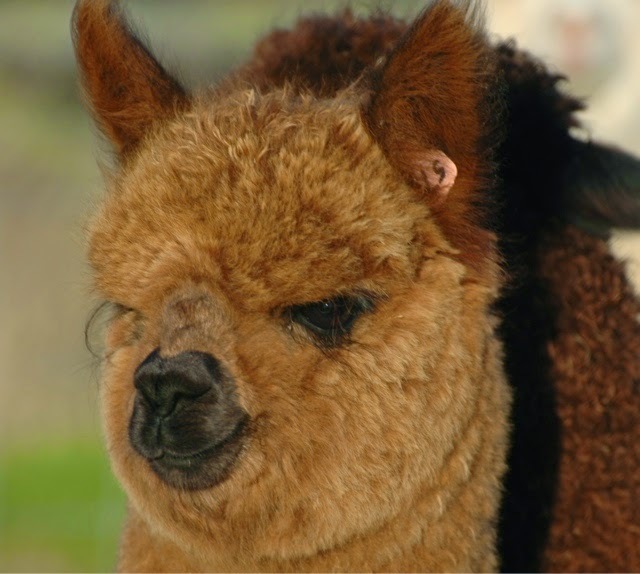 So we describe the vestigial reverse canines which appears in male alpacas around three years of age. Once in the wild, many thousands of years ago, these would have grown formidable and aided a dominant male to defend his harem. 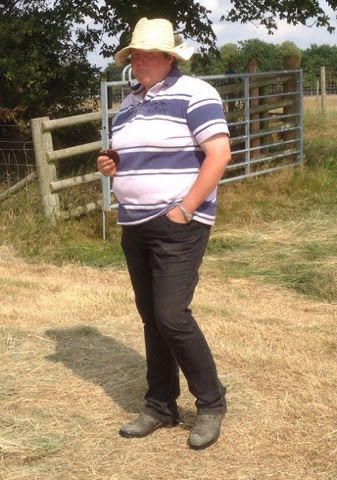 Nowadays we nip them off set shearing with a rope saw, preventing any of our males inadvertently developing an armoury. Tip for new owners- make sure your shearer checks and sorts these fighters in your mature males every year. If they refuse find another shearer- it's a must! And yes -they still grow even if they are castrated! Obviously to get a half decent photo of a black alpaca one needs to place a white one behind to provide a bit of contrast. 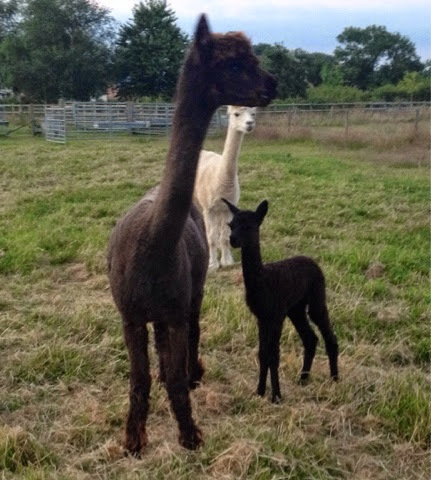 This young new born male cria from Du Prem alpacas managed to oblige me last night after I chased this wee shadow around the paddock for ten minutes! 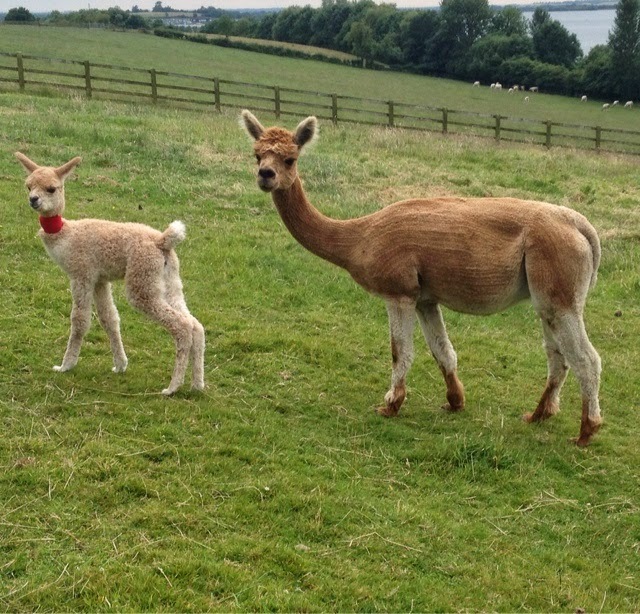 It doesn't take long for the alpaca crias to start copying their mothers and each other. 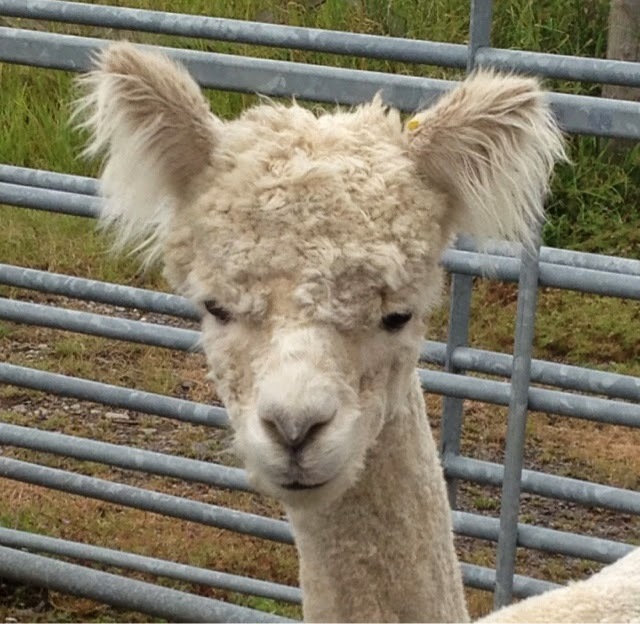 The young dark fawn alpaca female in the foreground is being bottle fed and of necessity is getting onto grass and hay very early. 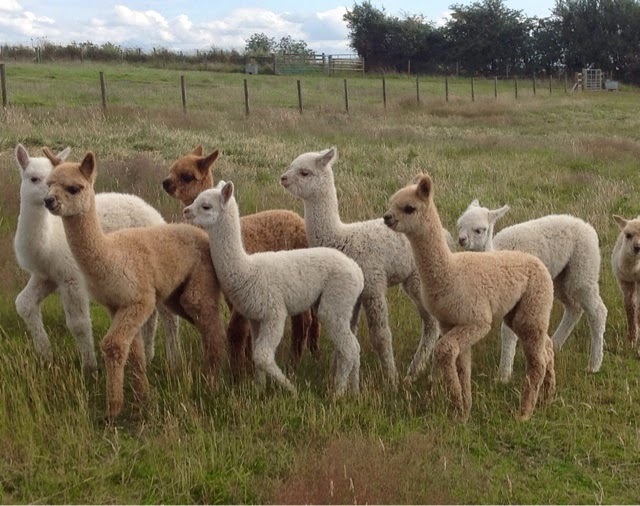 Never an animal to be left behind the other cria of course join in. 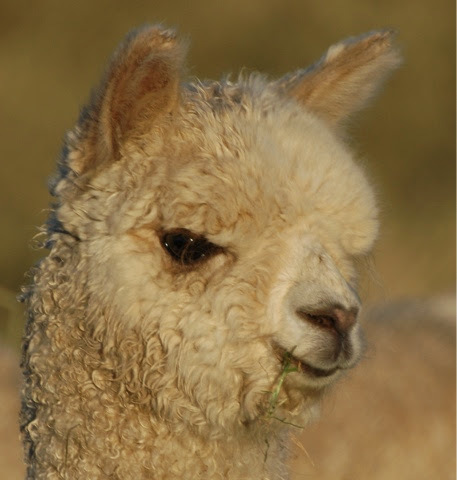 True to type Alpacas work very much on the principle of- 'What's good for one is good for all! Fab ears on the 2013 girls. 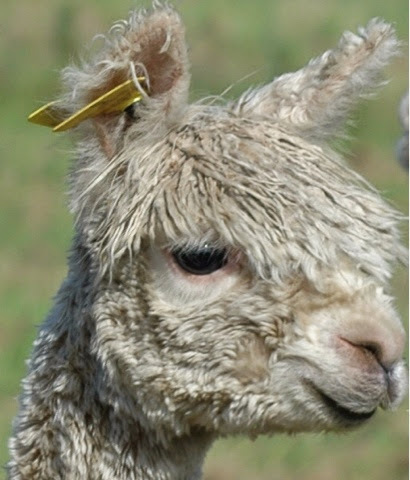 Flying lessons wouldn't be out of place for this young elite alpaca female. A lot of our superb females are exhibiting these accessorised ears to die for. Must come with the fleece! Mind you what else do you do when you are adolescent except groom oneself to attract the boys! 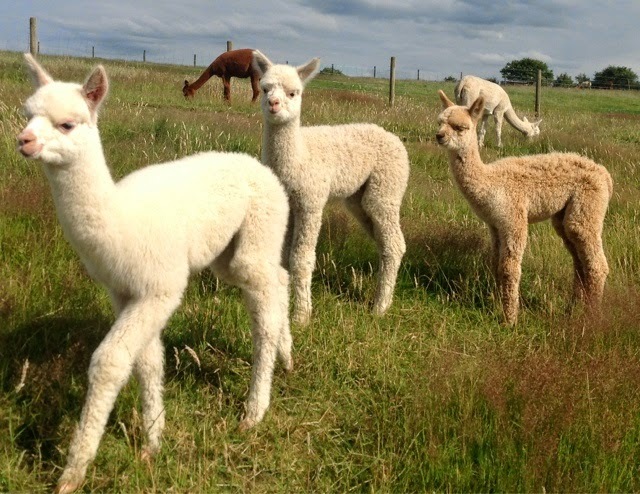 Labels: #toftuk, alpaca females, Alpacas for sale, pedigree alpacas, toft alpacas. 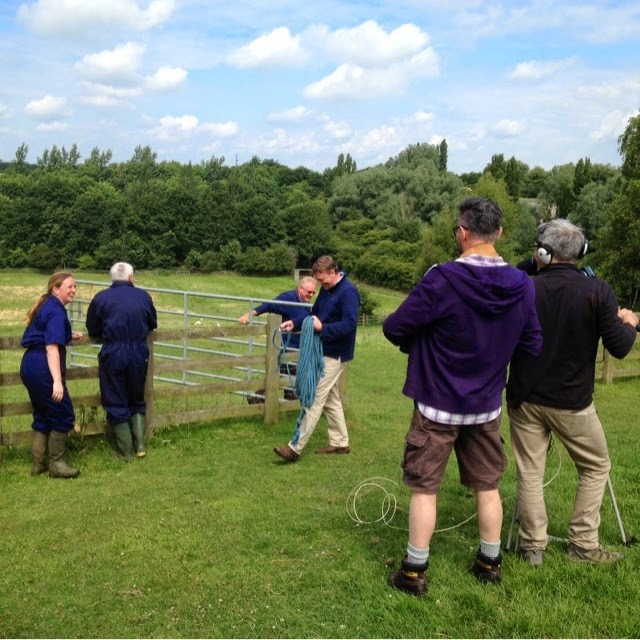 Busy week last week on the Manor when the BAS film crew turned up to shoot footage for a husbandry video. 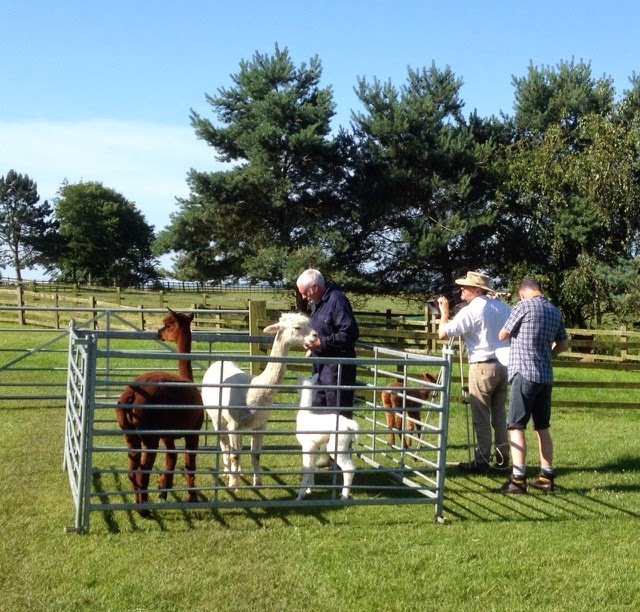 Toft were asked to host and supply the alpacas for the project as the film crew are all local. Two absolutely stunning days meant that all ran to schedule. 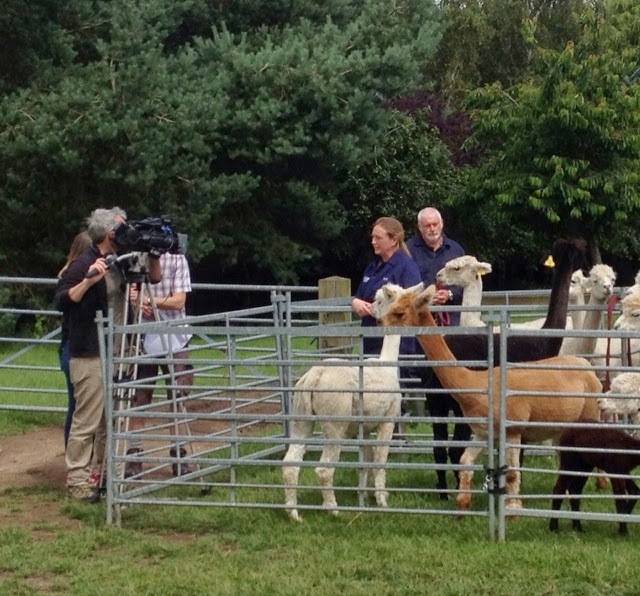 Our alpacas were exemplary, performing like they'd been trained at RADA. 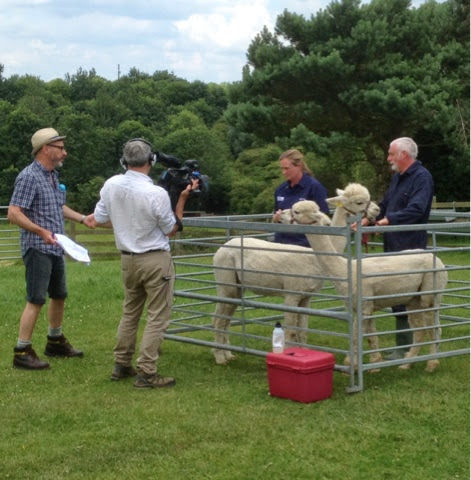 Garry Naish performed as hands on expert and shearer. 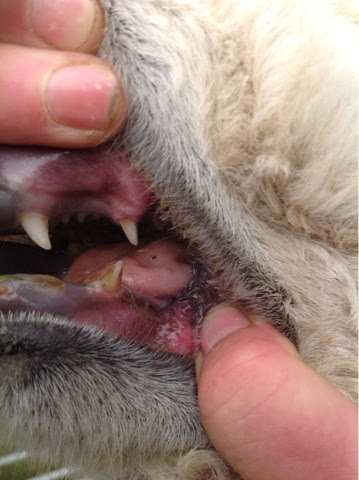 Alex McSloy from the Royal Veterinary College supplied the veterinary expertise and performed as presenter. BAS Board members- Nigel Beckwith and Peter Roisetter were the hands on help and we all had a lot of fun. 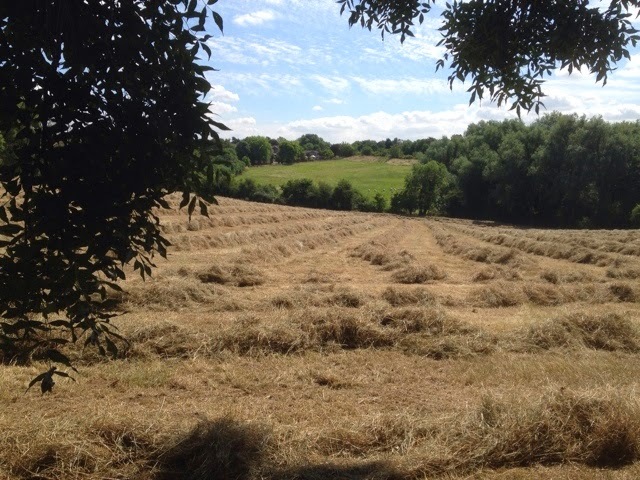 Next week, if the weather holds, we'll get a couple of alpacas and some chariots and have a crack at remaking Ben Hur! PS. we shear on a table not the ground. The ground gets further away from me year on year. 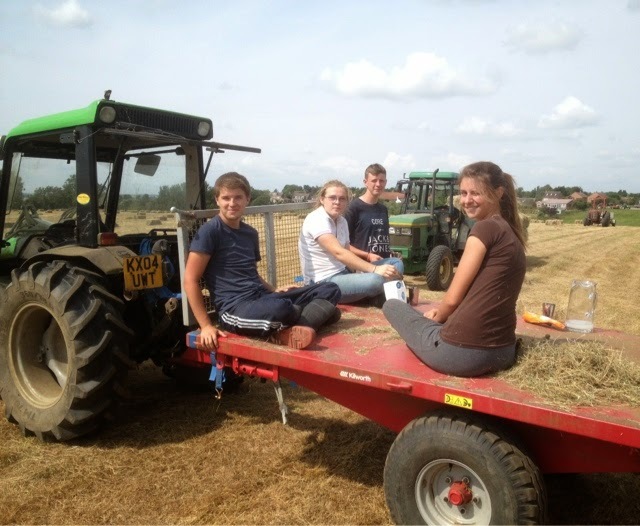 The fleece is a lot easier to manage shearing off a table when your knees aren't aching! 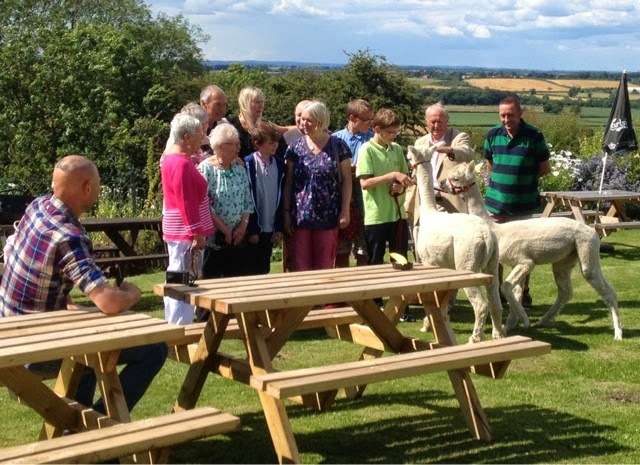 The White Hart Inn at Ufton joined the alpaca fraternity yesterday when they took possession of two lovely pet alpacas from Toft. The pet boys hadn't been there 5 minutes and they were dragged into a random family photograph to add interest. 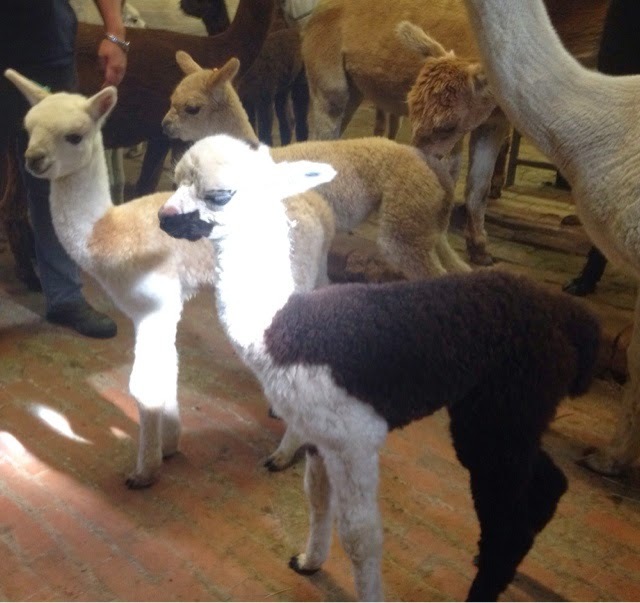 There is no doubt that these pet alpacas will soon be the stars of the show and a major attraction at the White Hart Inn.